Gnomolicious is an GNOME applet that help you post links on the del.icio.us site simply by drag'n'dropping them. Gnomolicious is project written in python using the pygtk bindings. 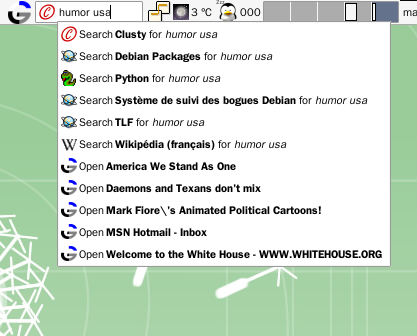 The library used to connect on the del.icio.us API was the work of Frank Timmermann. I now use my own implementation of this, mainly because it offered me the opportunity to play with lxml a pythonic binding for the libxml2 and libxslt libraries. Here are some view of gnomolicious in action. 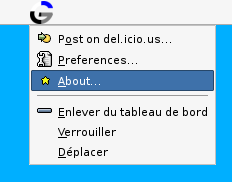 I have tried to make the integration of this applet in the desktop environment as smooth as possible. Posting an URL to del.icio.us. 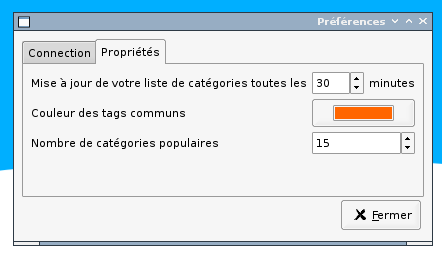 The deskbar applet uses the dbus interface to find pages matching some tags. 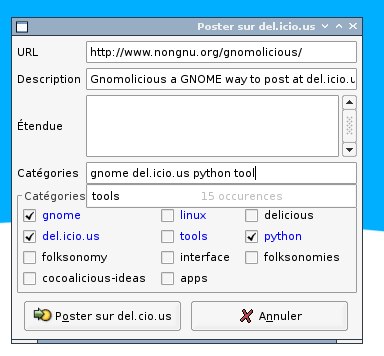 In order to install gnomolicious, you need the GTK/GNOME bindings for python. These can be found on the pygtk website and on the GNOME website. Once you have installed these. You are ready to run setup.py install in the base directory of the package. If you encounter problems installing this software do not hesitate to post a request for help. This is still a first draft, it's working but there are a lot of stuff that would really render this applet way more usefull. This is free software anybody can join !